The tour along all the BEP windows was a real succes. A lot of people showed up at 21:00 at the first window on Bellamyplein. UmbrellART supplied a selection one of a kind umbrellas. MC DRT did a good job explaining in his style the art from members of Xstreets & friends that was exhibited in each window. Check out here for pictures! Big thanks to Stichting BEP! On the 9th of April UmbrellART will show some of their hand painted umbrellas from the UMbrellART collection at the tour of Xstreets art hanging in the BEP windows. MC DRT will give you in poetic style information about the artists and art pieces you will pass by. 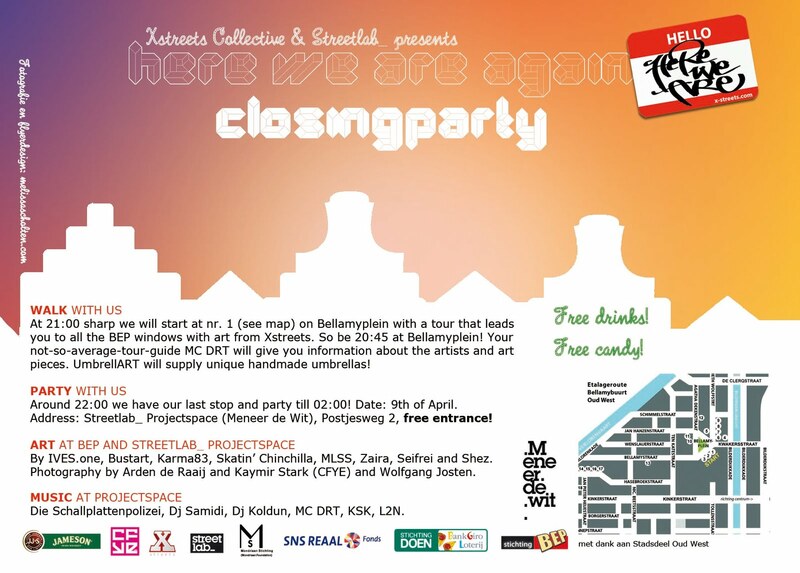 Check for more information, a map of Bellamyplein and details about the free closingparty at http://xstreets.blogspot.com. See you on the 9th! 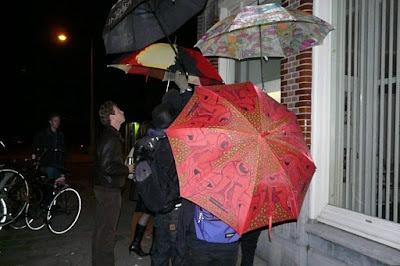 On the 9th of April 2010 there will be an events that includes some of the wonderfull umbrellas of UmbrellART. So mark the date already in your agenda. Location will be Amsterdam-West. But you will find more information soon on this blog! Check out here more pictures, by the American Book Centre. 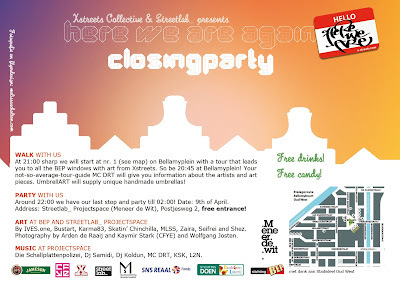 UmbrellART is an initiative of Xstreets Collective. The idea for an umbrella show started with IVESone designing an umbrella. Some talks with friends further, the idea is now like this: every artist designs an umbrella of their choice, with whatever they want to design on it. They will stay the owner of their umbrella. The umbrella is for at least one year in our show. The show includes now more than 40 different umbrellas made by artists from all over the world. - The artist that designed the umbrella is the owner of the umbrella. At any time he or she can get the art object back. The costs for sending (to us and from us) are for the artist. But when it is in the show it belongs to the UmbrellART crew and they can do whatever they want with it. So they can show the umbrellas everywhere they want to Let it Rain! Except when the artist let us now that certain things will be excluded. - UmbrellART is not responsible for any damage to the art object. It is and article of use. Of course UmbrellART will be as accurate and careful as possible with the umbrellas. Also missing umbrellas is not the responisbility of the UmbrellART crew. We will do anything to prevent that of course! 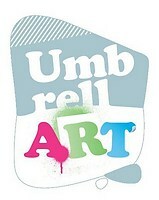 - UmbrellART is not responsible for the harm to people and or company's made by the artist as a statement or mockery. The artist that made the object has copyright and it is her or his responsibility. - The artist(s) will give their price that they want for the umbrella for sale. This price includes 15% for Xstreets. With this percentage Xstreets can organise world wide show with UmbrellART. The rest of the money is for the artist. The umbrella can be sold at any event of UmbrellART or trough the website/webshop. If you like to join UmbrellART and you accept the conditions, please send an e-mail to umbrellart [at] gmail.com! We want to thank several persons who helped us with organising the shows. ALFONS SCHOLING (FLYER DESIGN, PHOTOS), MELISSA (PLANNING, MARKETING, PRESS, DESIGN), FLO (PHOTOS, PRESS),Josephine Severn (PHOTOS, IDEAS, PUBLISHING ON HER BLOGSPOT), BRAM HEEREN (PHOTOS), AARTI ZIA (VISAGIE), JEROEN (PLANNING), , MENNO (FILM), LOUBNA (MODEL), MEZ (MODEL, PLANNING) AMY (POEM, PLANNING), MARIEKE (SOLAR FESTIVAL), CHIEL VAN ZELST (CHIELLERIE GALLERY), PEPE AND RENE (IMPLIVA), IVESone (PHOTOS, IDEAS), SUE (SUPPORT), FRANK & ARJEN DIE SCHALLPLATTENPOLIZEI (ACT), DJ 4WAY (ACT), DJ KOLDUN (FUNKY JUNKIE), FREDEE BRAZIL (ACT), MC DRT (ACT), MC SISTALIN AND MC PYRO (RAPPARTMENT), COLIN (OT301), STEF, ANITA, ALBI, TOBI, DAVID, DEAN, MARIEKE (TRUUS.TRENDY), DAVE (TAGGER BAGS), MAURITS, CFYE (PHOTOS, REPORT), WESLEY, AMNESIA, AND OFF COURSE ALL THE ARTISTS INVOLVING UMBRELLART AND THOSE WHO WE FORGOT AND LOVE! THANK YOU ALL, YOU ALL ROCK!